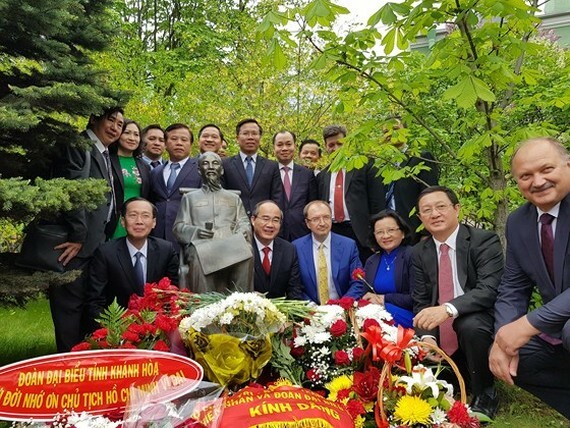 Politburo member, Secretary of HCMC Party Committee Nguyen Thien Nhan and the municipal high-ranking delegation offered flowers to the statue of President Ho Chi Minh at the St. Petersburg State University, celebrating the 128th birth anniversary of President Ho Chi Minh (May 19) during the city's delegation visit to Russia. The delegtion visited Institute of Ho Chi Minh in Saint Petersburg State University, the only research institute on the spiritual heritage of President Ho Chi Minh outside Vietnam. Mr. Nguyen Thien Nhan then witnessed the signing of cooperation program between director of the Vietnam National University – Ho Chi Minh City Huynh Thanh Dat and President of the St. Petersburg State University Nikolai M. Kropachev. Founded in 1724, St. Petersburg State University is the oldest institution of higher education in Russia. At present, there are more than 32,000 students in University, receiving education in more than 323 specializations in 24 faculties. University’s staff comprises almost 14,000 people, including nearly 6,000 teachers. Heads of the Russian government were graduates of St.Petersburg University, including V.I. Lenin, and V.V. Putin and D.A. Medvedev.